Today is Go Texan Day in Houston. This annual event is ushered in with trail riders on horseback in a symbolic ride from points north, south, east, and west. 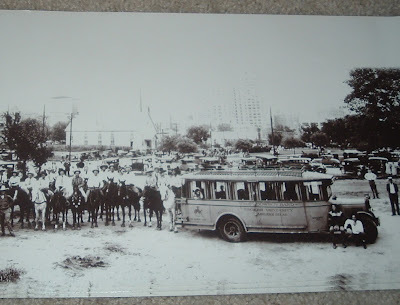 These trail rides, which last from days to weeks, all converge in Houston's Memorial Park today. The trail riders and their parade through downtown Saturday, along with the World's Championship Bar-B-Que Contest at Reliant Park, kick off the Houston Livestock Show and Rodeo, a celebration of Western heritage and culture that officially starts March 2nd and will run through March 21st. When I was a kid in elementary school, we used to get Fat Stock Day as a holiday from school. That's how big a deal it was. They don't do that these days, but many folks still dress Western for work on this day, wearing their jeans, boots, and cowboy hats. 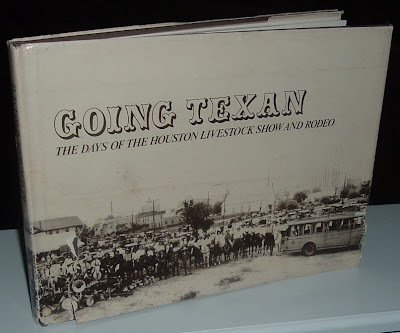 Enough of that... this is about ephemera and, accordingly, I have a piece of ephemera related to the appropriate book for the occasion, Going Texan: The Days of the Houston Livestock Show and Rodeo, by photographer Geoff Winningham (published by Mavis P. Kelsey, Jr., 1972). The jacket's picture runs from front flap to rear flap and is reproduced for the promotional piece I'm exhibiting here today. 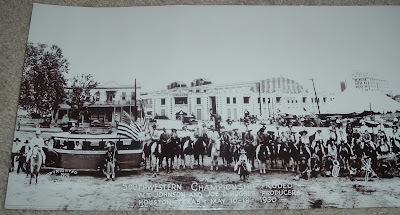 This is a panoramic view of the 1930 Southwestern Championship Rodeo in Houston, Texas, May 10-18, 1930. The rodeo was produced by W.T. Johnson and Joe D. Hughes out of San Antonio. The next year, Houston started its own rodeo and livestock show--the Houston Fat Stock Show and Livestock Exposition, which evolved into the Houston Livestock Show and Rodeo, as it's known today. 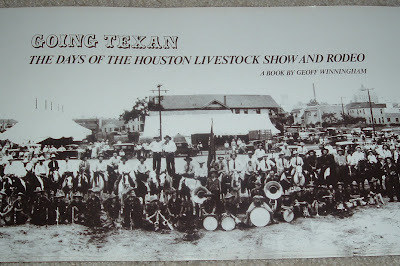 But this promotional photo for the Winningham's book depicts what is likely the genesis for the big rodeo and livestock shows in Houston. This promotional copy of the photo is much larger than the jacket, measuring 7 3/4 by 39 inches. I have no idea where such a Texas size ad was displayed for the book's publication, or maybe it never was displayed. The dealer I bought it from had a whole batch of them from an estate sale and threw in some extras with my purchase. I'm not even sure what to call this other than a promotional photographic print for Winningham's book. It's not a broadside, though it is very broad. It's just an interesting piece to have, connected with a book that celebrates this important event in Houston, Texas, and southwestern culture. 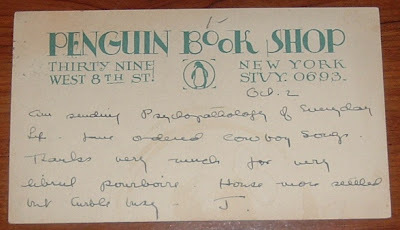 In 1924, an employee of the Penguin Book Shop in New York used this company post card to reply to a customer about an order. "J" informs the customer, whom he (or she) seems to know, that one of the books, Psychopathology of Everyday Life is on the way. Another book, Cowboy Songs, has been ordered. An eclectic reading list to be sure. What is not sure is the history of this book shop with the playful typeface in its logo. For some reason, I thought this would be an easy one to research. That's not proving to be the case. All the vital stats are on the card: Thirty-nine West Eighth is the address. The phone number is STUY 0693. And they're no help. But I did find a book with an interesting title that provides some sense of the backdrop against which the Penguin Book Shop operated. 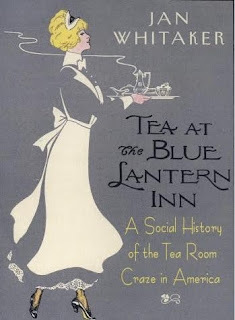 That book is Tea at the Blue Lantern Inn: A Social History of the Tea Room Craze in America, by Jan Whitaker (St. Martins, 2002). The Bohemian lifestyle and culture flourished in Greenwich Village in the 1920s and that's where the Penguin Book Shop was located. Tea rooms dotted the landscape and often shared space with other businesses such as gift shops, boutiques, and the like. Whitaker mentions a weaving studio named Kraftwoven that shared the same address as the Penguin Book Shop at West 8th St. So perhaps you could pick up a copy of Psychopathology of Everyday Life and a wool sweater at the same location. Artists flocked to the area and I can only assume that, for awhile at least, the Penguin Book Shop was a cool little book nook to browse and hang out. Likely, they weren't the only book shop in the Village, so I don't really know how they stacked up against the competition. I guess I had this place hooked up with Penguin Books, but that old publisher ain't that old. 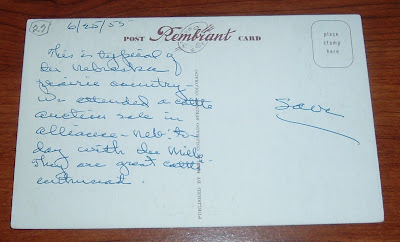 They got started in 1935, some nine years after the postmark on this post card. One other thing in the message on the card... After a status report on the books ordered, J thanks the customer for the "very liberal poirboire." I don't know a poirboire from a po'boy sandwich, so I got educated on poirboire, which in business terms is a tip or gratuity. So J's got a pretty generous customer. Whitaker lends support to that theory in her book, reporting that prosperous middle-class Americans became fascinated with the Village and began visiting from all over during the 1920s. Alas, the Penguin Book Shop barely reveals itself in a google search in the 21st century, a modern-day gauge for determining various levels of past achievements or status. I like the look and feel (as best I can grasp it) of this little book shop from nearly 90 years ago, but I'm afraid there's just not much else to report on. This card from the Roaring Twenties seems to represent a bookselling concern that went out with a whimper. An incorrect supposition? No... not unless I can find out more about this flighty Penguin. 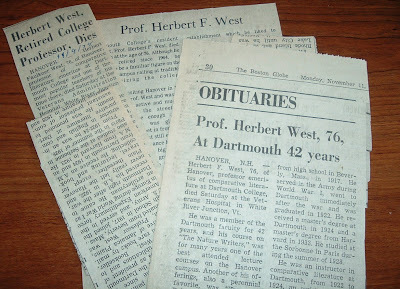 A nice, second-hand bookstore find three years go introduced me to a passionate bookman and popular Dartmouth professor of literature: Herbert Faulkner West. I wrote about it then on the Archaeolibris blog (pre-Bibliophemera), and have modified that piece for its fitting inclusion on this blog. 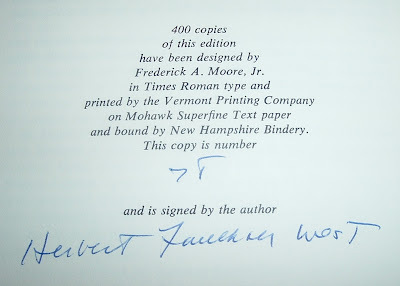 The book I found is SUNNY INTERVALS: A Bookman's Miscellanea, London / San Francisco / Hanover, by Herbert Faulkner West (Westholm Publications, 1972), signed and numbered by the author in a limited edition of 400 copies. A serendipitous find, this book also had several pieces of ephemera laid in years ago by the previous owner (to whom I am very grateful!). 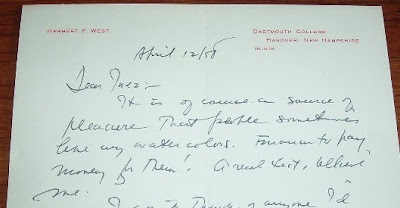 Among the small cache of paper was a letter from the author, as well as correspondence from the book's previous owner, relating items about the author. 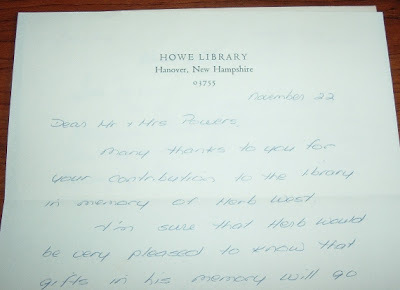 There were several newspaper articles about West's death (1974) and long career in education as well as a thank you note from the Howe Library in Hanover, New Hampshire, regarding a contribution in West's memory to buy books. Very fitting. I feel fortunate to have discovered him through this book, and am indebted to the kind stewards at the used bookshop for keeping intact the associated ephemera from a previous owner connected to Mr. West. As for the textual content of this book, West's book buying trips to the cities comprising the title of this book are full of detail regarding his purchases and from whom he purchased the books. That information provides interesting insight to the values and provenance of certain books and authors he collected, such as Robert Frost, W.H. Hudson, T.E. Lawrence, T.S. Eliot, and William Butler Yeats. The first chapter may explain finding this copy of the book in a Texas bookshop. The book begins with a 1964 trip to Texas, where West meets with J. Frank Dobie in Austin. Dobie is legendary in Texas and he and West seemed to have had a friendship. Mr. West finds Dobie in ill health, but still getting around. Subsequent chapters detail various book buying trips West took to California and London. One chapter that details a book buying expedition to London shares its title with the book's title. West never fails to mention dealers and their stock and exactly what he bought. Often times he mentions what he paid for a collectible book, giving collectors and dealers alike an idea of how much certain books have appreciated over the years. For example: The Story of the Malakand Field Force, by Winston Churchill (1898) cost West $125 during a California buying trip in the 1960s. Today, for a nice first edition of that book, he could expect to pay between $3,000 and $4,000. Another purchase, James Joyce's first book, Chamber Music (immaculate condition) set him back $182. Today, that book would quickly run up into the thousands, possibly as much as $10,000. Regarding booksellers, West knew quite a few of the prominent ones in both America and England. Collectors and sellers alike, if they've been at it long enough, have undoubtedly heard of Serendipity Books in Berkeley, California. West recounts a 1968 visit with Peter Howard, the owner, shortly after he had opened Serendipity. West prophetically proclaims, "I think he has quite a future as a bookseller." For those who enjoy a vicarious trip among the continents in search of rare books, Sunny Intervals offers an appropriate vehicle. Here' an 1865 letter from the Providence, Rhode Island bookseller Sidney S. Rider, signed with the company name of Sidney S. Rider & Bro. On the surface, it looks like a short note from a bookseller to a prospective customer. But lurking among the few lines in reply to an inquiry is a good bit of history for the bibliophile. The copy of Drayton's Poems is in superb condition, folio 10 1/2 x 16 1/4 inches--large clean margins--plates in fine condition--binding old calf mottled--sound--the copy came from the library of J.H. Markland Esq the last surviving member of the celebrated Roxburghe Club--lowest price $20. Sidney S. Rider & Bro. This brief response offers clues for the curious bibliophile to research, which is exactly what I did. First, I learned about a bookseller I'd not heard of before. That in and of itself is no big deal. Thousands upon thousands of booksellers of all stripes have come before and relatively few stand out among the rest as memorable. Rider may not make the cut for most, but he is worth knowing about, especially if you have an interest in Rhode Island history. Searching the Internet for information about Rider, I found a book I'm going to have to buy for my reference library. The Dictionary of Antiquarian Bookdealers offered a good bit of information on the bookseller, Sidney S. Rider. He was more than a bookseller, though. He was an antiquarian, author, and publisher. His introduction to bookselling came at an early age when he began work as a boy with Charles Burnett at his book shop on Westminster Street in Providence. He later succeeded Burnett and took over the business after Burnett's death. Rider paid particular attention to stocking the finest editions of English literature and he expected his customers, when they made inquiries, to heed his directives on what to purchase. He may have expected Mr. Moulton to purchase the book of Drayton's poems, though he was merely describing the book rather than recommending it in this correspondence. In the 1860s, after the Civil War, Rider began publishing pamphlets on Rhode Island history, a venture he would continue for the next 40 years. He extended his publishing to other areas of interest, most notably his popular Book Notes, from 1883-1916. Book Notes dealt with Rider's opinions about books and history as they related to Rhode Island. Also in the late 1860s, Rider began a publication he called Bibliomaniac, which dealt with literature and the fine arts. At the time of this letter, these publications had yet to see print. Stepping away from Rider, what about the book that is the subject of this letter--Drayton's Poems? That would be Elizabethan poet, Michael Drayton (1563-1631). The preceding link is for an interesting and beautifully designed site called Luminarium, which is worth a visit for fans of English literature from Medieval times through the Restoration. Drayton was a friend of some of the most famous men of the age. He corresponded familiarly with Drummond; Ben Jonson, William Browne, George Wither and others were among his friends. There is a tradition that he was a friend of Shakespeare, supported by a statement of John Ward, once vicar of Stratford-on-Avon, that "Shakespear, Drayton and Ben Jonson had a merry meeting, and it seems, drank too hard, for Shakespear died of a feavour there contracted." I can find only a few copies of anything by Drayton published before 1865, the date of Rider's letter. I don't know how collectible Drayton was in 1865, or how difficult it was to come by his books (they may have been long out of print by 1865), but copies I found, contemporary to Drayton's era, approach four and five figures. The twenty bucks Rider was asking seems like quite a bargain! Finally, there was Rider's mention of the previous owner of the book in his letter to Mr. Moulton. Specifically, the book was owned by what looks to be J.H. Markland Esq., whom Rider refers to as "the last surviving member of the celebrated Roxburghe Club." The Roxburghe Club was founded in 1812 and is the oldest society of bibliophiles in the world. Its membership is limited to 40, chosen from among those with distinguished libraries or collections, or with a scholarly interest in books. It has also been distinguished, among the many publishing societies that have done so much in this country for history, letters, antiquity and other branches of literature and art, for the quality of its publications. Markland appears on the club's members roster as James Heywood Markland, Esq. He does not appear to be a charter member, but is among the earliest, having been inducted by the original 18 members in the club's initial year of 1812. His membership ran through 1845. I wonder what impression his provenance with the book of Drayton's poems made on Mr. Moulton? 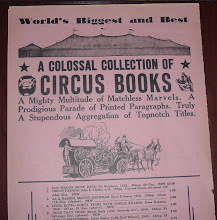 Suffice it to say this little letter of bibliographic description has made an impression on me, with its various trails of inquiry into the intriguing world of antiquarian books and their authors, collectors, publishers, and sellers. Happy Valentine's Day! Here's an appropriate item for the day--an ad cover acknowledging the occasion for 1900. 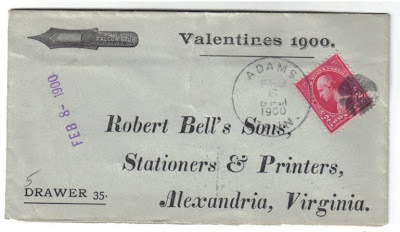 Robert Bell's Sons, the Alexandria, Virginia printer, apparently printed a special batch of self-addressed envelopes, creating the above ad cover for their company and one of their non-printing products--the Falcon Stub (a style of nib for a fountain pen). The company seems to have enjoyed a long tenure in Alexandria. The earliest reference I can find is 1834 from a Web page on the Alexandria Library site featuring, appropriately enough, a Valentine card (below) from the company. Robert Bell's Sons is listed as a printer in the 1834 Occupational Directory and located on "Green near Royal." According to the 1860 Boyd's Washington and Georgetown Directory, Robert Bell's Sons moved to 110 South Fairfax Street. It stayed at that location another 87 years listing itself as a printer, bookbinder, stationer, engraver and an office supply store. The ad cover is dated February 8, 1900. If the above information is correct about the company's longevity, and we assume they entered into business in the 1834 (may have been earlier), 24 years would elapse before the 1860 Boyd's Directory. 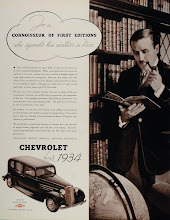 With the additional 87 years indicated, the company would have survived well into the 20th century, to 1947. So we know they existed for at least 111 years and quite possibly more. That seems a pretty good run, especially for a small business. Abraham Lincoln was born 201 years ago today. Last year, for the bicentennial observance of his birth, I wrote about an interesting post card from the State House Book Shop in Philadelphia, which curiously sported an image of Lincoln (Franklin seemed more appropriate). This year, I have a different piece that hits a little closer to home for Lincolniana. 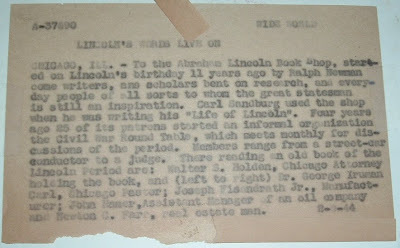 Here's a press photo from the Abraham Lincoln Book Shop in Chicago, Illinois. 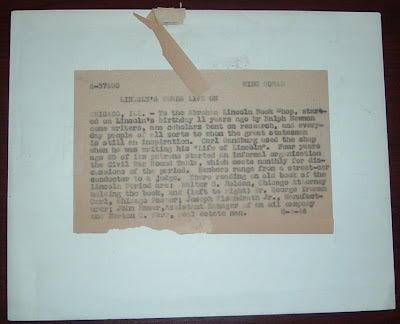 The back of the photo has a typed sheet of paper that appears to be dated 2-8-44. Other notation, for the record: A-37690 and Wide World. The title of the release is "Lincoln's Words Live On." CHICAGO, ILL.-To the Abraham Lincoln Book Shop, started on Abraham Lincoln's Birthday 11 years ago by Ralph Newman come writers, ans (SIC) scholars bent on research, and everyday people of all sorts to who the great statesman is still an inspiration. Carl Sandburg used the shop when he was writing his "Life of Lincoln". Four years ago 25 of its patrons started an informal organization the Civil War Round Table, which meets monthly for discussions of the period. members range from a street-car conductor to a judge. 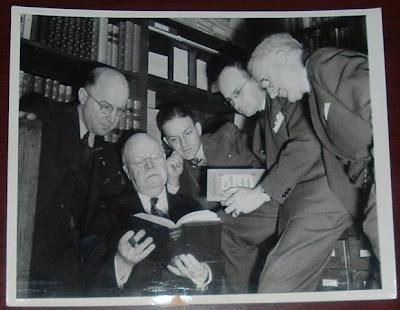 There reading an old book of the Lincoln Period are: Walter S. Holden, Chicago Attorney holding the book, and (left to right)Dr. George Truman Carl, Chicago Pastor; Joseph Eisendrath, Jr., manufacturer; John Hamer, Assistant Manager of an oil company; and Newton C. Farr, a real estate man. The old book shop is still around at 357 West Chicago Avenue in Chicago. 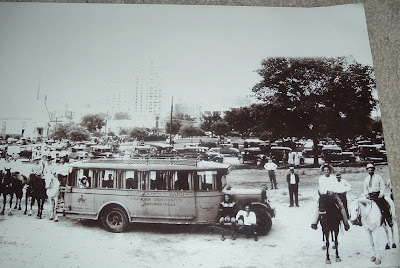 It was established in 1938, so was a mere six years old when this photo was taken. I doubt they allow cigar smoking in the shop now (the man holding the book has a lit stogie!). Click on this link to see the Abraham Lincoln Book Shop today. Here's a bookmark printed specially for the book, The Orphans' Nine Commandments, by William R. Holman (TCU Press, 2008). Posting it here is an appropriate follow-up to my previous post, which also involved William Holman and books--his and his wife's donation of their private collection of valuable books on the book arts. The bookmark's content offers a brief teaser for a compelling story awaiting the reader. The red notation was made by Mr. Holman to encourage comments by readers. And I would encourage anyone to read this powerful and engaging memoir and let Mr. Holman know your thoughts. I did and what follows is a modified version of that correspondence. 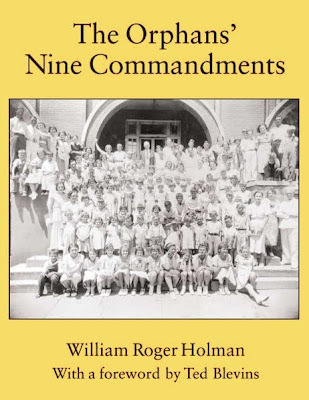 The first chapter of The Orphans' Nine Commandments will knock the wind out of you and lay the foundation for the emotional, gut-wrenching journey a young boy (Holman) is forced to take through orphanages and foster homes during the 1930s and the Great Depression. As you recover from the shock of what happened to William, who starts out in life as Roger Bechan and is given new names along the way, you'll learn of the human spirit to adapt and survive, even in a little boy stripped of his family, home, and name. This compelling memoir is fraught with cruelty from adults and countered with the resilience and adventure of a young boy growing to manhood, carving out, painstakingly, an existence and new identity for which he seeks meaning and worth and, above all, love and acceptance. Larry McMurtry calls Holman's book "an important and compelling memoir." Of Holman's struggle and private hell, McMurtry states further that Holman will take his readers along in a way "that will move you, inform you, and haunt you." This is a horror story as well as a success story. It's repugnant and poignant, humorous and jubilant. Mr. Holman succeeds in taking us lockstep through his darkened childhood with vivid detail against a backdrop of characters, good and evil alike. At times, it reads like a picaresque novel with the pathos and humor of Dickens and Twain. The reward in the reading is the triumph of the spirit with threads of hope for love and understanding woven into an achievement of family and success, against overwhelming adversity in the formative years. There's a new collection of books at the University of Texas-Pan American Library (UTPA) in South Texas and a new bookplate to identify this important collection. 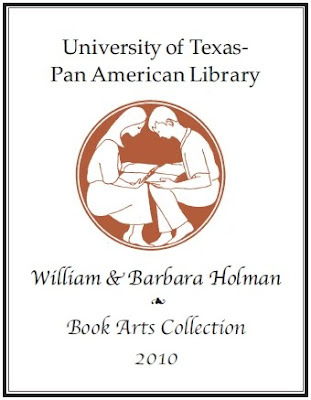 A substantial Book Arts collection now resides in the UTPA Library, thanks to the donors of those fine books--William and Barbara Holman of Austin. The William and Barbara Holman Book Arts Collection focuses on the various aspects of the book arts, such as typography, book design, fine printing, and the influential artisans and their imprints. The Holmans (Barbara Holman is an illustrator) also designed the bookplate above for the collection, a copy of which Mr Holman sent me and permitted me to share here. UTPA is one of the major universities in South Texas and it is important we continue to build its book collection. Our Book Arts Collection is composed of titles that are unique to the library and should add to the library’s depth in the fields of book arts, history, art, graphic design and literature. The Holman Book Arts Collection is being prepared for permanent display later this year in the Special Collections department of the UTPA Library. 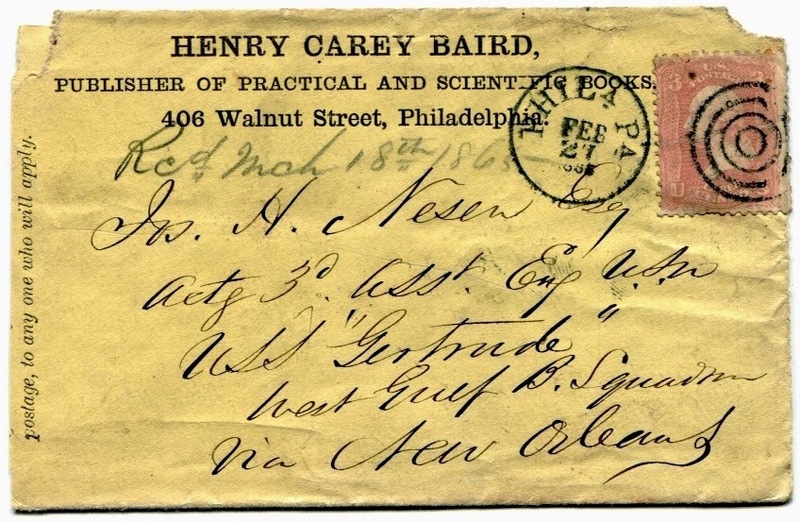 As the Civil War (American) was coming to a close, a Philadelphia publisher of "Practical and Scientific Books," Henry Carey Baird, sent a letter to a soldier serving on the U.S.S. Gertrude in the Western Gulf of Mexico. 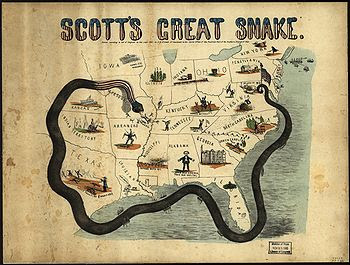 U.S Army General Winfield Scott devised the Anaconda Plan, so called because the intent was to "choke off" the Southern ports from supplies and goods with a naval blockade and end the war quickly and with as little bloodshed as possible. The U.S.S. Gertrude was originally a Confederate blockade runner, a ship used to try to break through the blockade and get to port with supplies. She was captured in 1863 and converted into a Union blockade ship. After capturing a few blockade runners of her own, she was assigned to the Western Gulf Blockade Squadron, which is identified on the publisher's cover as Western Gulf B. Squadron. One of the officers on board the U.S.S. 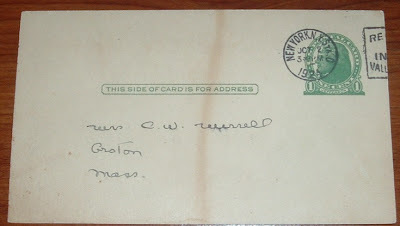 Gertrude was Acting Third Assistant Joseph H. Nesen, the recipient of this letter. And in this marvelous Internet age we live, a few keywords and a click later on a search engine and I have images of Mr. Nesen in one photo, copied from an ebay auction it would appear by the logo in the lower right corner of the photo. By the time Nesen had received the letter from publisher Baird, in March of 1865, the U.S.S. Gertrude had been assigned to blockade the Texas coast and had spent much of the previous year off Galveston. The letter found its way through the South to New Orleans and from there it appears to have gone directly to the U.S.S. Gertrude. Delivery time was one month. It's interesting to ponder the route it took to get there. Mail delivery into enemy territory couldn't have been easy, as noted in this essay on the subject. It would have been nice to see the correspondence still with the cover, but I'm grateful just to have this interesting cover. I do wonder, though, if Baird's correspondence confirmed a book order for Nesen. If so, what book or books? Baird published scientific books, so was Nesen interested in a book about ship operations? Engineering of some sort? 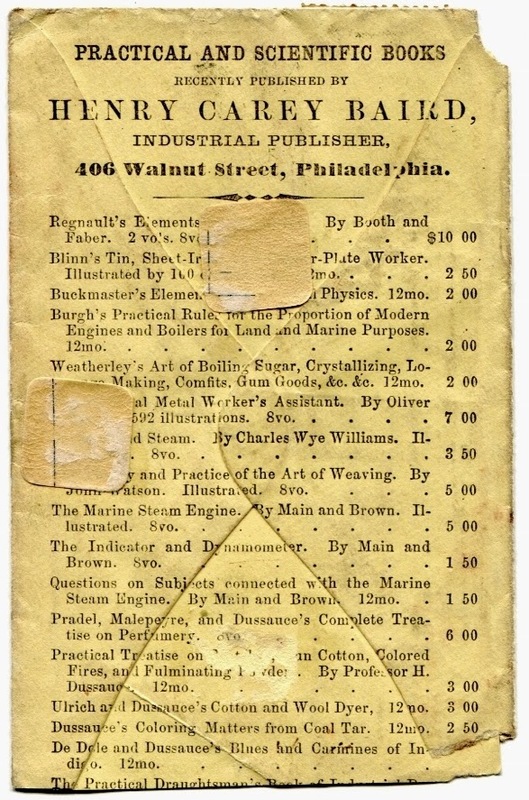 Baird used the backside of the company's envelope to list the kinds of books they published and sold. Here, the company is referred to as "Industrial Publisher." Several titles about marine steam engines and boilers jump out at me as strong candidates for books Nesen may have been interested in. 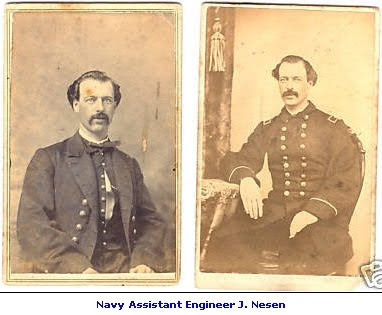 And this site about naval history helps confirm it by listing Nesen as one of the engineers on the ship. The correspondence itself is lost forever, unless it resides in a family archive somewhere or with a private collector. Still, it's fascinating to me that with a little window of information from the sender--an address, some business advertising--such a large amount of history comes rushing in. Several weeks ago, there was a discussion introduced on the Ephemera Network about business cards. Frank DeFreitas, whose holography specialty of ephemera is found at Antiquarian Holographica, invited participants to join the group Business, Trade & Calling Cards and to share examples. 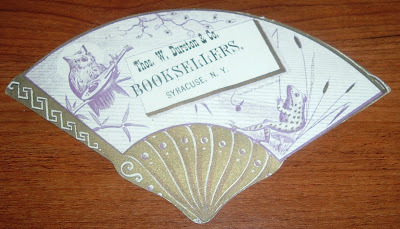 I submitted the card below from Thomas W. Durston, Bookseller, of Syracuse, New York. 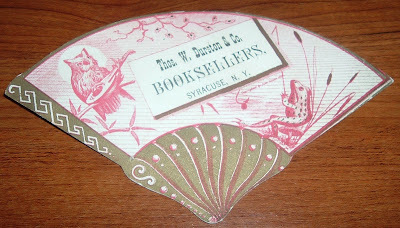 I have found references to Durston's book shop in the 1880s, so the card dates from about that time to possibly the turn-of-the-century. The ubiquitous bookseller symbol, the owl, is present in the design, but this one is holding or playing what looks like a mandolin. I'm not sure what that represents, nor am I sure about the fishing frog's role in representing this business, but they do a good job of making the card interesting. But as interesting as it might be, there is a collection of trade cards that just blows these samples away for artistic appeal. On the aforementioned Ephemera Network, Tom Murphy, of Encore-Ephemera, shared a link to an ephemera site called Sheaff : Ephemera, created by Boston artistic director, typographer, and stamp designer Richard D. Sheaff. 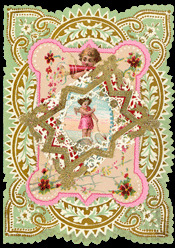 He is also a prolific collector of ephemera and features on his Web site a stunning collection of cards under the tab Artistic Printing Album. When you're done feasting your eyes on those beauties, which may be awhile, be sure to click the Artistic Printing page for an interesting and informative article on the Artistic Printing movement, developed by British and American letterpress printers during the Victorian era. Looks like branding time at Walt's, where there's not a bookshelf, let alone any books, in sight. 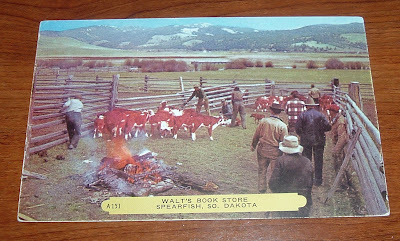 Here's a curiosity of a post card, circa 1955, for Walt's Book Store in Spearfish, South Dakota. From the photo, either Walt's had a run on his inventory or this is the future home of Walt's. Gotta do something about those cattle first. Looks like the branding irons are in the fire and some of the cattle are already getting their tattoos. All cattle, no books. I don't know what this says about Walt or his book store. Maybe Walt was a rancher, ran a few head of cattle. Probably his book store stocked Western Americana, ranching and range books. Or he just liked this picture and didn't care that it had nothing to do with his books or his store. I don't blame him if that's the case. It's beautiful country. Better than looking at a building with his business name painted on it. Gives tourists something nice to send or save, as appears to be the case with the purchasers of this card. There may be some confusion about where they were, though. They refer to the picture as typical for Nebraska prairie country. Spearfish is closer to Wyoming than it is to Nebraska, its neighbor to the south. But maybe it does look like the Nebraska prairie and they finally found a postcard in Spearfish that looked like Nebraska. 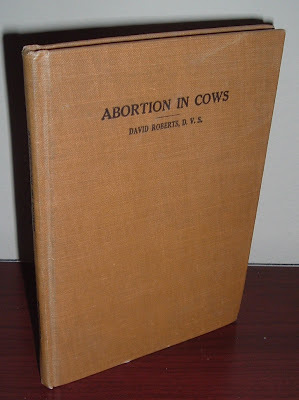 If they had time to browse Walt's shelves, I wonder if they might have come across this 1908 "range classic," Abortion in Cows, by David Roberts, D.V.S. I just found this book a few days ago and had to buy it for the unusual nature of the subject, the date, and its condition. Somehow, it made me think of Walt's post card, which I've had a good while now. 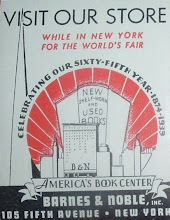 The book was probably just as scarce in 1955 as it is now in 2010. As far as I can tell, I have the only copy in the world. At least, nothing's showing up on the Internet. Then again, Walt's Book Store doesn't show up in the photo, if you trust your eyes. But I think the book I found pairs up nicely with Walt's post card. 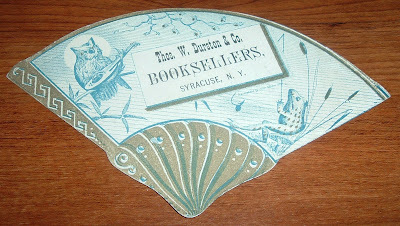 Austin G. Putnam was a bookseller, stationer, and bookbinder, as well as a manufacturer of blank books, according to this 1858 billhead. He practiced his trade at 456 Washington (corner of Essex), in Boston. I had hoped to make a connection to the G.P. 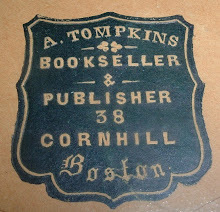 Putnam & Sons publishing family that got started in New York in 1838 as a bookselling concern, but no luck yet. There may not be any connection, or it may be very distant. So far as I know, there are no close ties between the two Putnams. 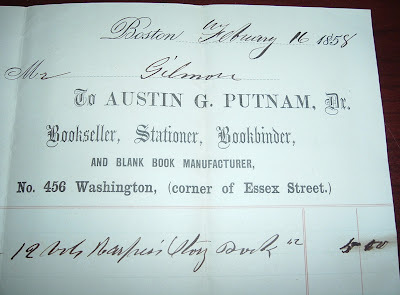 As for Austin G. Putnam, he's proving to be an elusive historical figure, but a snapshot of his business history is contained in this billhead from February 16, 1858. On this day, he completed his transaction with Mr. Gilmore for binding what looks like a 12-volume set of a story book. I can't make out the first word in the title. It looks like he charged $4.00 for that good bit of work. Twelve volumes had to have taken some time. What I did find was a symbol of significant American history at the origins of the country's rebellious stand for independence. 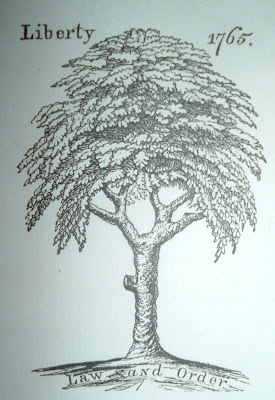 The striking feature of this billhead is Putnam's choice for a logo--the tree with "Law and Order" across the roots and "Liberty 1765" across the top. What does all that mean? Less than a hundred years prior to the date of this billhead, the British Crown sought to raise revenue to cover its rising debt and the cost of maintaining troops in the Colonies. The Stamp Act of 1765 was a means of doing so. The act required the purchase of a tax stamp for transactions involving all printed matter, from newspapers to legal documents and bills of lading for shipping. The reaction of the colonists, to say the least, was not very favorable. The opposition movement adopted the name Sons of Liberty and united social classes across the colonies. The Boston chapter, led by Samuel Adams, is said to have had its meetings under the Liberty Tree, which is represented by the illustration on the Putnam billhead. So Liberty and 1765 become obvious with their connection to the Stamp Act of 1765. The words "Law and Order" beneath the tree possibly signify the need for restraint from mob violence during protest. That line was crossed at times by members of the Sons of Liberty with rioting, looting, and other acts of violence, including destruction of personal property and the ransacking of the Massachusetts Governor's house (Thomas Hutchinson). The old elm tree in Boston Commons, which was the Liberty Tree, was cut down by British soldiers occupying Boston on the eve of the American Revolution. Could that be the sawed-off limb on the left side of the trunk in the illustration? I thought that a curious detail to include in the graphic until I read about the tree being chopped down. I also wondered why Putnam would use a symbol from the American Revolution era for his business in 1858. Perhaps his book shop was located near where the Liberty Tree stood. I thought also about his genealogy, that maybe there was some proud heritage dating back to those times. There is no shortage of Putnam names for leadership during the Revolutionary War--General Israel Putnam and General Rufus Putnam are the most prominent. Could one or both have been related to the bookbinder of this 1858 billhead? Could one have been a grandfather or great-grandfather? 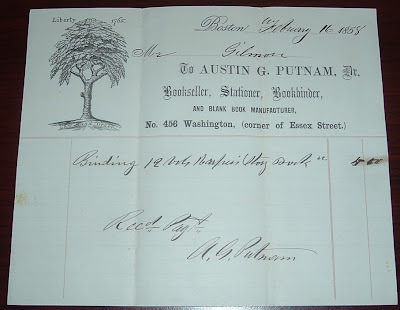 Whatever the reason for using the Liberty Tree on his company paper, Austin G. Putnam felt strongly enough about it to identify his business with it and incorporate it into his correspondence. Ironically, another stamp tax act, the Revenue Act of 1862 was enacted by the U.S. government a few years after the date of this billhead, which required tax stamps on, among other things, various paper items. Revenue was needed to help finance the Civil War. 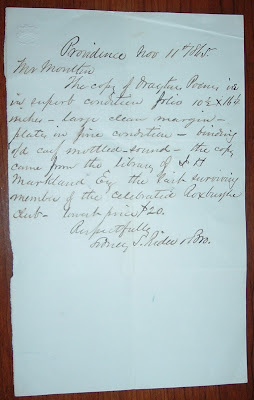 See my post on a related piece of ephemera.